- 22 HP Briggs and Stratton Twin Cylinder overhead valve 4 stroke engine. - 26 HP Kawasaki Twin Cylinder overhead valve 4 stroke engine. The name Toro inspires confidence. As one of the premier mower brands worldwide, the Toro company has earned a reputation for fine products for decades. The Toro commercial line of mowers has influenced the features found on their homeowner line, while keeping the price low. Toro ZTR mowers are a good combination of ‘must have’ features and affordability. The price is kept low by using dual Hydro-Gear power units on the drive wheels, instead of hydraulic pump-motor combinations. Make no mistake - this is still a great way to drive a mower without sacrificing quality. The cutting decks on the Timecutter series are made of stamped steel. This is less durable than fabricated steel, but it also serves to lower the price of the mower further. One thing that is not compromised on the lower cost machines is mowing speed. Most owners of a ZTR mower would agree a Toro ZTR mower will cut grass substantially faster than a riding tractor or riding lawn mower. Even the lower cost Toro ZTR mowers represent a quality product. Every Toro ZTR mower features the ‘3 in 1’ option,allowing for side discharge, mulch, or rear bagging. The deck cutting height is adjusted manually using a lever, or with a foot control on the more expensive models. 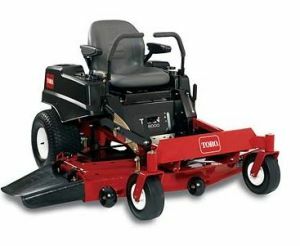 The frame design for Toro ZTR mowers depends on the model. The Timecutter Z models have a fully welded steel frame, with no joints to come loose. The Titan series has a more aggressive grade tubular steel frame, which is considered commercial-grade. Toro ZTR mowers are available in 2 model series - the Timecutter Z (less expensive, fewer features) and the Titan (heavy duty, closer to commercial grade). The Titan models are more expensive, have higher horsepower engines, a sturdier frame, fabricated steel cutting decks (instead of stamped steel) and more hefty transmissions. Either the Timecutter Z or the Titan will mow the lawn in significantly less time than a lawn tractor or riding lawnmower. There are four Timecutter Z models available, and four models in the Titan series. The Timecutter Z series offers a choice between a single cylinder Kohler Courage engine, or a Kohler Courage twin cylinder engine. Horsepower ranges from 19 HP ( single cylinder) to 25 HP (twin cylinder). Both versions of the engine feature a pressurized oil system, with a replaceable oil filter. The lap bars controlling speed and direction are padded. Moving the bars outwards activated the integrated automatic braking system, which is an attractive safety feature. All Timecutters have a sturdy Hydro-Gear EZT transmission at each drive wheel. All the Timecutter Z mowers have an electric PTO to engage the cutting blades, which is activated by flipping a switch. The cutting deck is fabricated out of stamped steel on all the Timecutter Z models. Adjusting the deck height is accomplished by a multi-position hand lever. A foot assisted lever is available as an option, and is standard on the model Z5060. , powered by the muscular 25 HP Kohler twin cylinder engine. Foot assisted height adjustment, arm rests, and wide front tires all come standard. Count on spending between $2800.00 to $3500.00 for the mowers in the Timecutter Z series. This is very competitive when stacked up against other comparable residential ZTR mowers. All the Titan mowers have an electric PTO to engage the cutting blades, which is activated by flipping a switch. The cutting deck is fabricated out of fabricated steel, which is much more durable than a stamped steel deck. Adjusting the deck height is accomplished by a foot pedal, instead of using a hand lever. This is a standard feature on all Titans. The transmissions on the Titan series are a heavier duty Hydro-Gear ZT2800, that includes charge pumps to help with performance. Deck spindles are oversized in the top 3 models. Adjustable armrests come standard, and are attached to the 18” contoured high back seat, which can slide front to back, and is suspended by adjustable seat springs. Model ZX 5000 comes with a 50” triple blade cutting deck, and is powered by the 20 horsepower twin cylinder engine. This is the only Titan with a stamped steel deck. Model ZX 5000 has a 3 blade 54” cutting deck which is fabricated steel, complete with a bull-nose bumper. The engine is the 23HP Kohler twin. Model ZX 6000 has a 3 blade 60” cutting deck, powered by the 25HP engine. The deck is fabricated steel with bull-nose leading edge. Model ZX 6050 has a 3 blade cutting deck which leaves a 60” swath in the rear view mirror ( in case you are wondering, rear view mirrors do not come standard on ZTR mowers. Keep looking ahead, baby!). It is powered by the unstoppable 26 HP Kawasaki twin engine. Count on spending between $4200.00 to $6000.00 for the mowers in the Titan series. Most customers that invest in a Toro ZTR lawn mower would buy another in the future, based on high satisfaction.